﻿ Iker Casillas: "Between Cristiano Ronaldo and Messi, I choose Ronaldo"
07.07.2011 » Casillas: "Between Cristiano Ronaldo and Messi, I choose Ronaldo"
Iker Casillas visited a Real Madrid foundation in Beijing, China and said that Cristiano Ronaldo and Lionel Messi are the best players in the World, but he prefers CR7. 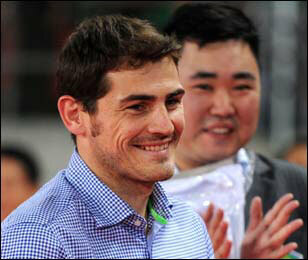 Casillas also said he talked with José Mourinho and denied rumors about losing Real Madrid's captaincy. 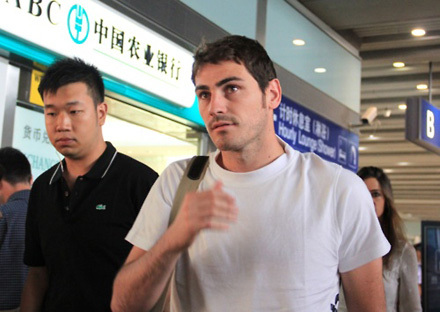 Real Madrid goalkeeper Iker Casillas, went on a small trip to China's capital city, Beijing, in order to visit a Real Madrid institution. Casillas took the chance to assure everyone that he talked with José Mourinho and that he'll remain Real Madrid captain in the next season. The keeper also assumed he prefers having Cristiano Ronaldo on his team, instead of Lionel Messi from Barcelona. In the last days, several rumors on the Spanish press were indicating that José Mourinho wanted to switch captaincy in Real Madrid and deliver it to a field player. In the frontline, appeared the names of Xabi Alonso, Sergio Ramos and Cristiano Ronaldo. In a voting poll released by the Spanish newspaper Marca.com, if Casillas was really about to hand out the captaincy to another player, the readers voted Xabi Alonso as the player better suited for the job, followed by Sergio Ramos and lastly by Cristiano Ronaldo. 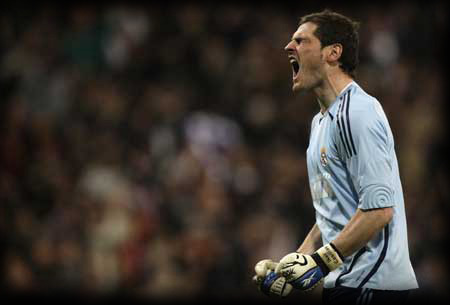 However, Casillas assured that he talked with José Mourinho and even though he understands the argument that a field player could defend the team's interests in a more active way in some situations of the game, the Spanish goalkeeper said that he'll remain Real Madrid captain in the 2011-2012 season, after having talked with José Mourinho. Casillas: "I talked with Mourinho and changing the captaincy is not an option for now. There's no need for the press to speculate anymore. That could be a possibility, but only in the future and if anything bad happens or for any other particular reason. But so far, there's no indication or probability for that to happen." Iker Casillas also commented Fábio Coentrão arrival to Real Madrid, coming from S.L. Benfica. The transfer fee was evaluated at 30 million euros, but Ezequiel Garay should head the opposite way, in order to reduce the price to 20 million euros. Fábio Coentrão, a Portuguese left-back, shares the same agent as Cristiano Ronaldo, Pepe, Ricardo Carvalho and Di Maria, which is the Portuguese "super agent" Jorge Mendes. Casillas was then asked if having so many Portuguese players on the team could affect the locker room: "They are all very nice and good people. There were never problems regarding Real Madrid players in the locker room between people who speak different languages, and besides that, all the Portuguese players are learning Spanish." Before ending this small interview, Iker Casillas was forced to choose between Cristiano Ronaldo and Lionel Messi. Casillas: "They are the best players in the World. They share a lot of ambition and they put a lot of effort and dedication to play well and help their teams. But between Messi and Ronaldo, I choose Cristiano Ronaldo."